So, it's all but settled that Windows Phone 8 is the biggest thing to happen to smartphones this year. But are the handful of flagships carrying it the best thing that could happen to users? Properly powered and engineered to perfection, the Nokia, Samsung and HTC WP8 smartphones are all making a bid to break iOS and Android's grip on the market. They are all fine species of smartphone. With the same screen resolution and chipsets powering them, with the Redmond-mandated hardware specs, they all have Microsoft written all over. But then, it's only the Taiwanese that actually have it in writing. There's only one Windows Phone 8X - and it's the HTC Windows Phone flagship. Not a bad way to start now, is it? 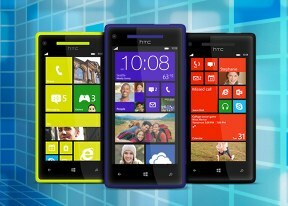 It must be quite a lift for the HTC Windows Phone 8X to feel special among clearly superior rivals. While Nokia and Samsung gave their WP top dogs those massive screens, HTC went for a relatively modest 4.3"� LCD. On one hand, it sounds like a smart move. The HTC Windows Phone 8X will be the only option for those looking for a more compact premium device that carries Microsoft's latest mobile platform. On the other, this could see the 8X relegated to a lower tier and made to fight it out with the likes of the Lumia 820. Now, that would call for some aggressive pricing and lower profit margins perhaps, which isn't exactly ideal for a company that hasn't had the best of streaks lately. We'll see if the gamble pays off but there's no rush. Let's see what the HTC Windows Phone 8X is made of, and what could've been better. It's not a short list of disadvantages by any means, but most of those are platform-specific and, judging by the reception Windows Phone 8 has been getting, they're not deal-breakers. At least not all of them. Now, the non-expandable storage and the single 16GB option is something to definitely consider, but if you can live with that, the HTC Windows Phone 8X is a must-see. The Beats audio label has finally been made to count as the HTC Windows Phone 8X offers a specially designed amplifier, while the wide selection of available colors makes it easy to find a unit that best suits your personality. Whether you go for the businesslike black or one of those peppier paintjobs, the HD screen and beautiful unibody design are always part of the deal. And that, as usual, is what we're going to start with.. Unboxing and hardware are coming up right after the break.